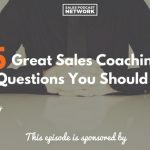 Home » TSE Podcast Post Page » TSE 898: What Role Does A Sales Coach Play In A Growing Organization? 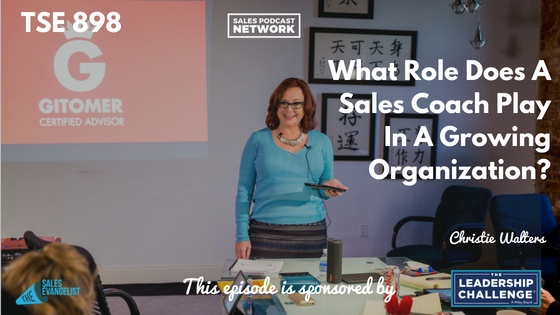 Christie Walters believes that sales is an act of service. She defines coaching as the secret sauce for all top performers. Coaches take on different forms, and Christie believes that the best coaches operate from the performer’s perspective rather than their own. She calls coaching powerful and transformative, and she relates that she worked with her own coach for 10 years before becoming one herself. Good sales coaches help you identify your own goals and your own internal struggles. The outside perspective a coach offers can help you fine-tune your life and your work. Coaches help us recognize our blind spots and the self-limiting beliefs that are holding us back. Coaches don’t necessarily indicate that there’s a problem. Very often, companies bring them in to initiate big change. Coaches help you design the future of your life instead of allowing your future to happen to you. Organizations typically engage coaches when they are trying to move to the next level. For sales leaders, in particular, it’s easy to get so busy managing out and up that you forget to manage down. If you’re managing down, you’re often not coaching along the way. What percentage of your time is spent nurturing your people? It’s really more than sales processes, which are important to success. It’s also more than sales training, which will largely look the same for every person in your organization. 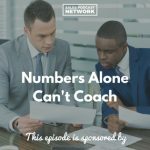 Sales coaching relates to the individual person because each of us has unique struggles. Coaching, together with training and leadership, can exponentially change the trajectory of your team. It’s difficult for sales managers and leaders to step into the personal level with their employees, but it’s a powerful tool for success. There must be a personal element for each person’s processes, and the path to success won’t look the same for everyone. Simply mimicking others’ success won’t work because each salesperson has a unique personality. Although there is value in parroting what you see and hear others doing, that cannot be your long-term plan. If you’re new to the industry, it’s ok to copy what others are doing, but develop your own techniques and your own authentic approach. If you aren’t selling from an authentic place, you might have small successes, but you won’t be ultimately successful. Christie said that although she is often hired by companies, she serves individuals. She strives to help people discover themselves and their own tendencies so they can tie those things to their own work performance. It’s about getting the individual deeply connected to the work he’s doing and about helping him understand his work as a service. He’s serving the people he’s selling to, and he’s supporting other things he loves by working. What drives you on a day-to-day basis? The first meeting will help you figure out what drives you, what blocks you, and what your blind spots are. Christie views coaches as accountability partners for their clients, and she notes that too many salespeople aren’t their own champions. She also stresses the power of a single negative thought and the power it has to spiral to more negativity. When salespeople learn to channel that frenetic energy into something that serves them instead of draining them, they’ll change their sales performance. Every salesperson will eventually struggle, and every company will eventually face transition. Coaches come in all shapes and sizes, but there are three elements to success for every organization. Build a solid culture which starts at the top. Create training programs that allow people to carry your culture into the marketplace. Coach your salespeople to avoid drift inside your organization. Be a champion for your salespeople and consider hiring a sales coach to transform your team. Connect with Christie Walters on LinkedIn, or on her website, ChristieWalters.com. Find her podcast The Why And The Buy, and listen to an earlier conversation between Donald Kelley and Christie Walters on episode 87 of her podcast. You can also call or text her at (770) 687-6678. Today’s episode was also brought to you by Video Jungle podcast, your source for marketing and making your brand pop using video. If you want to stand out, use video. Video is everywhere, and it can help you improve your presence. Plan, create and share your way to better content and strategy.